Expanding on the reliable and time-tested technology of the RemoteCam2™, RemoteCam3™ and RemoteCam3X™, the RemoteCam5 is part of Sound Control Technologies’ next generation product portfolio for digital PTZ cameras. The RemoteCam5™ camera Extension Kits offer a cost and time-saving alternative when integrating digital high definition PTZ cameras into a wide variety of presentation spaces. The RemoteCam5™ Kits provide a reliable “transparent“ link between the camera and codec/head-end. 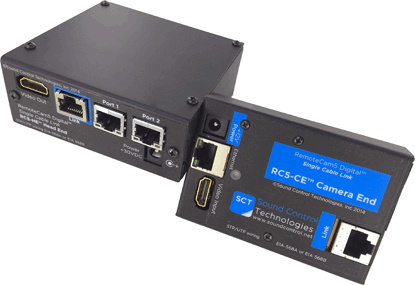 RC5-CST – for the Cisco SpeakerTrack 60 & SX80, C40, C60 or C90 codec. RC5-P60 – for the Cisco PresenterTrack, Precision 60 camera, MX800/MX700 Endpoints & SX80, Codec Plus & Codec Pro codec. RC5-CC6 – for the ClearOne Unite 200 camera & Generic Head End. RC5-P60 – for the Panasonic AW-HE40 & AW-HE60 camera and generic head-end. RC5-P13 – for the Panasonic AW-HE130 camera and generic head-end. RC5-SRG – for Sony SRG-120DH, SRG-300H & SRG-360HE cameras and generic head-end.